I just talked with my publisher... and my new extreme composting book is now UP on Amazon! "If you’re ready to throw out the rule book and return as much as you can to the soil, Compost Everything is the book for you. It’s time to quit fighting nature and start working with her to recycle organic matter and create beautiful gardens with some of the most extreme composting techniques known to Man! 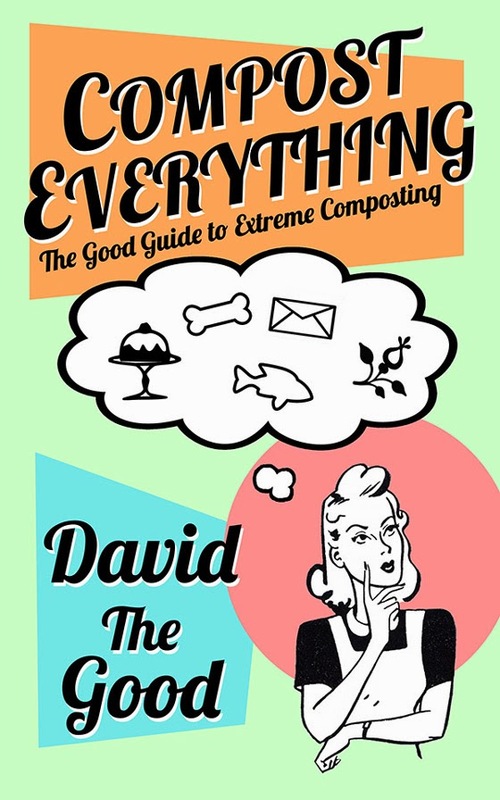 Learn to compost like you’ve never composted before with expert gardener and master composter David the Good." We priced Compost Everything at a really low introductory rate of $2.99 so we could be part of the Kindle Select program. That should bring us a wider readership (and get more people composting!). Thank you all. I know you'll enjoy this book. Just bought a copy and have read only a little thus far. My first impression is that it's a well-written, easy to understand, inspiring, and downright fun book to read. Thank you - that means a lot. Your Planet Whizbang Idea Book for Gardeners was a great read. Is it going to be published in paperback like the Food Forest book??? Eventually, yes. It's with the publisher and they decided to launch on Kindle first via a special Amazon program. Beware, though! Any attempts to compost the physical book itself will cross the physical/metaphysical barriers of our universe. Your compost heap would become the nexus for a new galaxy-eating black hole.